Megan Lyons is an attorney practicing in the Orlando and Dade County FL regions. After a series of intense life experiences she became passionate about the subject of narcissism and wanted to help those looking for relief from narcissistic relationship patterns and abuse. 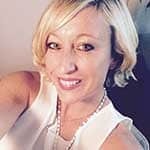 She wanted a blog to share articles and practical tips on how to cope with narcissistic entanglements and heal from the emotional turmoil that comes with them. The new site would be a place to learn do-it-yourself remedies, solutions and strategies to heal inner pain without relying solely on professional help or turning to dangerous chemical drugs. At the time she had a name and concept: the Self Love Sanctuary (SLS). Now she needed someone to help her develop the brand, design the site, launch it online and coach her how to use it to reach out to her ideal audience. "I know I can trust Josh and count on him to have to my back with whatever I need taken care of. He knows me well and knows my message. He gives genuinely personal service and is really good at what he does. I’m always happy with Josh’s work!" We had a series of meetings where we discussed her subject interests and goals for the new blog. We presented options and she chose a minimal article focused design. We made a UX Site map to show site pages and structural relationships. 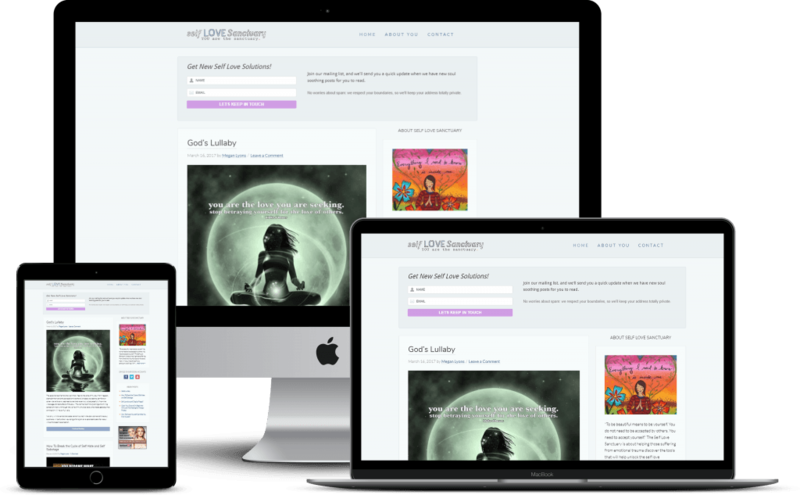 We had conversations about the brand identity for Self Love Sanctuary - what it was about, the focus, and her ideal site visitors problems, dreams and goals. Then we narrowed down the topic niches and content strategy for the blog. We helped her write a tagline and unique value proposition (UVP), as well as the About page text using what we uncovered during strategy sessions. We coached her on blog copywriting best practices and how to market her articles to gain traffic. We created some logo variations for Self Love Sanctuary and 3 Style Tile visual brand mockups for her to choose from. We created 2 logo variations and the pale baby blue and pink color scheme, friendly fonts, and subtle graphic elements. 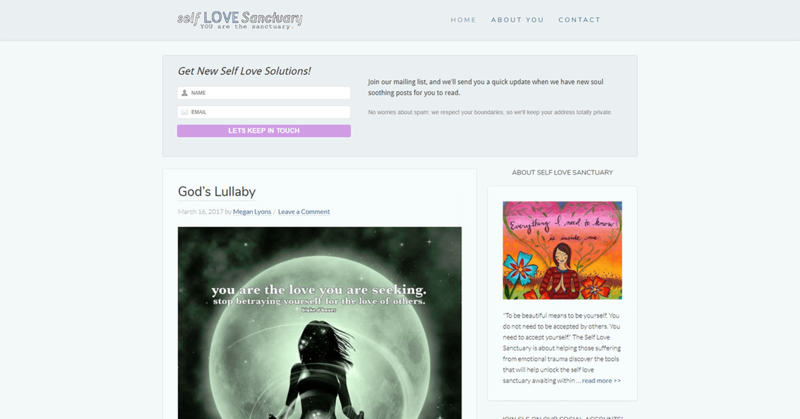 We used the Genesis framework and Beautiful Pro theme for Self Love Sanctuary. We used extensive custom coding with CSS and PHP to realize the visual brand. As always, we've educated, coached and answered all of Megan's questions and concerns throughout our business relationship. Megan has used the Self Love Sanctuary blog to help branch her career into new directions. Since launching the website she’s become a regular podcast host and contributor in the narcissistic abuse recovery community, and has refocused her law practice specializing in helping people in legal battles against narcissistic personality types.